A Los Angeles-based creative big band directed by Alan Chan! "Chan has given Los Angeles a jazz big band with an utterly unique tonal personality." "Definitely well put together with a good mix of brain and brawn." "“Every track here is a beautiful, soaring expression." Sept. 17, 2015 – Los Angeles, CA: To honor the legacy of the trailblazing musician, Symphonic Jazz Orchestra (SJO) Co-Music Director and ASCAP board member, George Duke, the Symphonic Jazz Orchestra and The ASCAP Foundation created the George Duke Commissioning Prize. The 67-member Symphonic Jazz Orchestra’s esteemed Music Advisory Board was tasked with the job of screening the numerous submissions from across the county, ranging from leading jazz veterans to promising young composers. In the end, Los Angeles based composer Alan Chan was selected as the recipient of the $10,000 commissioning prize and will write a new work for the ensemble for the 2016-17 season. Alan’s genre-bending music has been recognized with awards and fellowships from the American Composers Forum, New Music USA, and The Ucross Foundation among others. 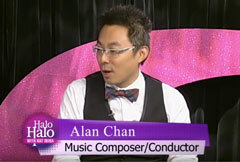 In 2011, he founded the Alan Chan Jazz Orchestra, which is comprised of top studio/jazz musicians from Los Angeles. His music has been performed around the world by such ensembles as the Brussels Jazz Orchestra, Millennium Jazz Orchestra, La Jolla Symphony, Taipei Percussion and sTop in Slovenia. The late composer and keyboard player, George Duke (1946 – 2013), was a peerless musical innovator and creator, as well as a mentor to many. His output as a recording artist was vast, from collaborations with Cannonball Adderly to Jean-Luc Ponty, Frank Zappa to Dianne Reeves, to over 40 albums as a solo artist. Simply put, George Duke had a major impact on the landscape of jazz, r&b, funk, pop and classical music. Created in 2002, the 67-member Symphonic Jazz Orchestra is dedicated to blending the worlds of jazz and classical music through its commissioning, performing and educational programs. Led by Music Director Mitch Glickman, the ensemble has performed throughout Southern California with leading guest artists including Dave Grusin, Christian McBride, Raul Midon, Lee Ritenour, The Yellowjackets, and George Duke. The orchestra’s debut recording “Looking Forward Looking Back” featuring George Duke’s “Dark Wood: Bass Concerto for McBride” was recently released on Mack Avenue Records. The Symphonic Jazz Orchestra/George Duke Commissioning Prize is made possible in part by a grant from The ASCAP Foundation Louis Armstrong Fund and the Bart Howard Fund. Founded in 1975, The ASCAP Foundation is a charitable organization dedicated to supporting American music creators and encouraging their development through music education, talent development and humanitarian programs. For more information, visit www.SJOmusic.org and www.ASCAPFoundation.org.